and moments you'll never forget. 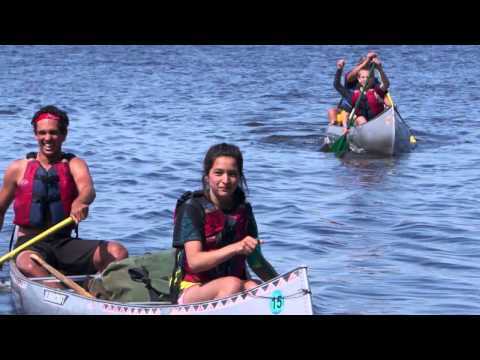 The Laketrails Base Camp program on Oak Island, MN is designed with the teenage camper in mind. Laketrails Base Camp has been providing wilderness canoeing and camping adventures for teens and middle school youth since 1952. The heart of our program includes a canoe trip through the Canadian waters of Lake of the Woods. Challenge yourself in the great outdoors while building friendships that last a lifetime. Join us at Laketrails for an adventure you’ll never forget! Challenge yourself in the great outdoors while building friendships that last a lifetime. We provide you with the opportunity to live in the wilderness, make new friends and do many things you don’t usually, or can’t do at home. The heart of the Laketrails wilderness program is a five to six day wilderness canoe trip geared to the experience level of the individual group. Find out more about how to sign up or schedule a Laketrails Wilderness Session. Download forms and information or register online! My life changed when I set foot on Oak Island, and my story is not unique. I left Laketrails as a whole new person. I gained so many skills, friends, and became empowered through facing the challenges of working with a team in the wilderness, and I am not unique. Everyone who comes through Laketrails is touched, by the beauty, by the people, by their own growth. Laketrails is a beautiful place full of energetic, creative people. At Laketrails, some of us are lucky to be part of an amazing staff, working in an incredibly gorgeous area full of rainbows, vibrant sunsets, and surprises called Lake of the Woods. Creating these memories–the ones I will never forget–is what will continue to always call me back to Laketrails. Like most camp sites I’ve been to in Lake of the Woods, I can close my eyes and instantly be back there. I can see the campsite with tents set up and a lit fire. ... As night comes I remember the beautiful stars and northern lights. Laketrails Wilderness Sessions are full of adventures and experiences that are sure to make for lasting memories. Here we’d like to share some of our favorites with you! Register for a Laketrails Wilderness Adventure Today!